← Market Timing Brief for the SP500 Index Close on 4-17-2014: Bouncing How High? 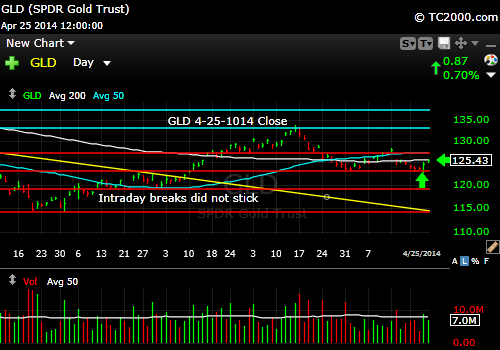 Market Timing Brief for the Gold ETF (GLD) and 10 Year Treasury Yield (TNX) Closes On 4-25-2014: Gold On the Move. Gold bounced from critical support this week after testing below it. This often happens with any financial instrument, including stocks. Stocks will often test just below a support level, though typically intraday and not on a close, but sometimes the test is below support on a close. If you set your stops too close to these levels you will often sell at just the wrong time. Meanwhile, interest rates continue to cooperate with Fed Chair Janet Yellen. Some claim it’s due to the soft economy with increasing expectations of the need for the Fed to slow down their easing of QE. The housing market has been somewhat soft after rising in price by over 12% year over year. And other blame the Ukrainian crisis and the flight to the U.S. dollar that often occurs during states of panic or semi-panic. The effect of these lower rates is to support the metals rally. Gold is still a buy with a stop beneath obvious support. As mentioned, don’t place your stop too close to that support just in case it is back-tested one more time (and if that’s not your style and you disagree, use a tight stop! “It’s your money..” as I like to say.). Rates fell back from a lower high. Look for updates on the main chart tracking pages this week as I feel they are needed and comments via Twitter @SunAndStormInv (see link to upper right). 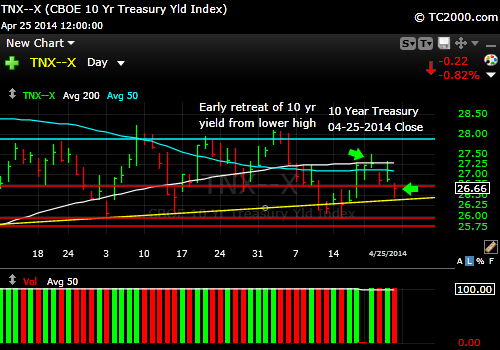 This entry was posted in Bonds, gold, investment, metals, Treasuries and tagged gld, market timing, tbt, tlt, tnx. Bookmark the permalink.